(Nanowerk News) A fast and accurate urine test for bladder cancer developed by A*STAR researchers has the potential to replace the currently used invasive physical probe. Cystoscopy — a clinical procedure that uses a narrow, tubular optical instrument called a cystoscope to view inside the bladder — is currently the gold standard for detecting cancer in this organ. However, the technique is not favored by most patients because it is invasive, expensive and time consuming. Malini Olivo at the A*STAR Singapore Bioimaging Consortium and co-workers have now developed a rapid immunoassay to detect and quantify alpha-1 antitrypsin (A1AT), a recently discovered urinary antigen and a potential biomarker for bladder cancer ("A Rapid and Label-free SERS Detection Method for Biomarkers in Clinical Biofluids"). The new tool could be used as a high-throughput screening platform to identify patients at risk of developing the urologic condition. 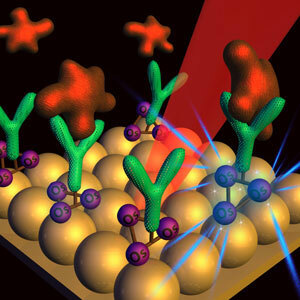 The immunoassay employs two advanced technologies, namely surface-enhanced Raman scattering (SERS), a powerful spectroscopic technique for detecting analytes at low concentrations, and bimetallic film over nanoparticles, a planar substrate for enhancing SERS signals. Together these technologies help to overcome interfering signals from the matrix background such as proteins in urine. The bimetallic film over nanoparticles is also coated with osmium carbonyl clusters to which target-seeking antibodies can be conjugated for assaying A1AT (see image). The researchers first tested the immunoassay on a series of standard solutions containing A1AT antigens at various concentrations in the range 10 to 1,000 nanograms per milliliter. They observed a ‘fingerprint’ of A1AT antigens — a spectral change in the 1,850 to 2,130 cm-1 region that increases with concentration. The scientists then tried the immunoassay on urine samples from nine patients. They found significantly elevated levels of A1AT in bladder cancer patients. There was also a marked difference in the A1AT concentrations of cancer and non-cancer patients, which suggests that the technique is highly discriminative, specific and accurate. Importantly, only tiny amounts of sample were required: A1AT concentrations could be quantified using as little as ten microliters of urine. Compared to conventional immunoassays, the SERS-based bioassay has two practical advantages: the low-volume sample requires no purification prior to testing and the device has a simple design. With further developments, the device may help save the lives of millions of would-be patients.